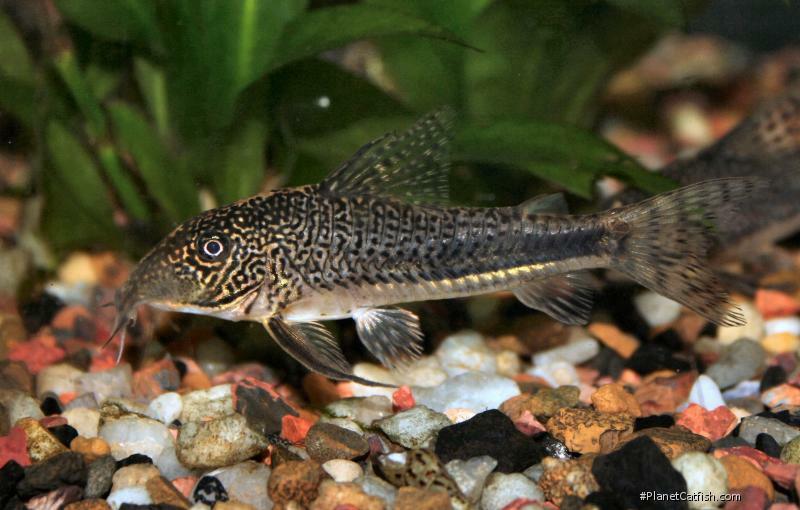 Affectionatly known as "the bearded one", Scleromystax barbatus (or Corydoras barbatus to give it its name at the time of this articles writing) is a fish often found on many a hobbyists wish list. It's certainly not another run-of-the-mill Cory and so to discuss it for this month's article we have enlisted the help of Ian Fuller (another "bearded one" as you can see from his photo - right). Ian has been keeping and breeding Corydoradine catfish for longer than I've been on this planet. His work is well known in catfish circles in the UK. Ian has been a regular photographer and, more recently, article writer for planet catfish. With the publication of his book (Breeding Corydoradine Catfishes) he joins the heavyweights of the catfish world. With that introduction, here are Ian's writings on Scleromystax barbatus, a cool cat indeed. The Bearded Cory is perhaps the longest of all the known Corydoras species, with adult males attaining a standard length (tip of snout to the caudal peduncle) of 100 mm. In terms of mass there are one or two physically larger Corys but they just don't compete in terms of stature! Quite apart from size (and who says it doesn't matter) a couple of features have made this fish one of the most sought after of all the Corydoras species; males are simply outstanding when it comes to mature colouration. Their flanks and upper body are marbled black over a golden tan base, the whole of the underside from mouth to caudal is creamy, beer-head white. The male's mask like head is charcoal black with brilliant gold-leaf blotches and wavy lines, the most striking colour feature being a broad golden streak (shown immediately below) that runs down the centre of the head from between the eyes to the tip of the snout. In the image above and immediately below you can see the second major, this time more physical, characteristic of C. barbatus. These are the bristles along the cheeks on each side of the head. This is a feature that is only found on three other known Corydoras species, these are Corydoras kronei A. de Miranda Ribeiro, 1907 Corydoras macropterus Regan, 1913 and Corydoras geoffroy La Cepède, 1803. 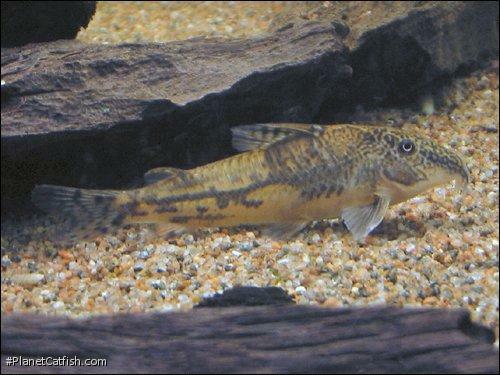 While on the subject of taxonomy it is interesting to note that C. barbatus was once placed in the genus Scleromystax because of many differences from other described species of Corydoras. 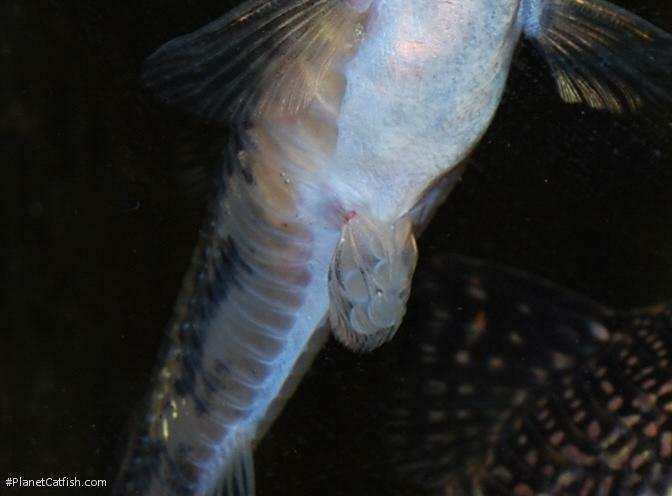 Male Corydoras barbatus have greatly elongated pectoral fin spines giving adults an ungainly yet impressive appearance. Additionally the second and third dorsal rays are also extended. This makes the fish more like Megalechis spp. than "traditional" Corydoras. In comparison to the males, female C. barbatus (shown immediately below) are nowhere near as brightly marked. They have a light golden tan body colour, lighter on the underside, with large dark grey to black blotches which join together forming a wavy pattern along the flanks, from the head to the caudal peduncle. In C. barbatus terms there is no such thing as a bearded lady - females never develop the side facing growths. 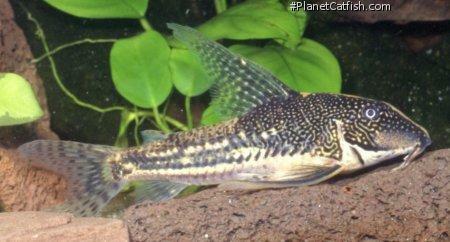 Corydoras barbatus is one of a few species of Corydoras that are not what we would term as being truly tropical. Their natural habitat is the fast flowing rivers that empty into Guanabara Bay in the State of Rio de Janeiro. This is an area that is 22º south of the Equator and here the waters are a little cooler, at times temperatures of below 60ºF are quite normal. In the aquarium these fish are best maintained at temperatures around 60º F. If Corydoras barbatus are maintained at the normal so-called tropical temperatures, around 75º F., they become stressed and usually will not survive for any length of time. The water need not be heated at all (given you live, for example in a heated, European or North American household) provided it is not going to be subjected to periods of extreme cold (below 50º F) for any length of time. In truth, a daily variation in water temperature would be more natural than a constantly fixed temperature. A power filter, either inside or an outside canister (which I prefer), should be used for two reasons; firstly to keep the water perfectly clean and, secondly, to create a reasonably strong water flow around the tank, emulating to a degree the running water in their natral environment. Weekly 20% water changes, using slightly cooler water than that in the tank would also be very beneficial. Etymology Scleromystax: From the Greek sclero meaning hard and the Latin mystax meaning moustache. From the Latin barbatus = bearded, alluding to the cheek bristles developed by mature males. Size 95mm or 3.7" SL. Find near, nearer or same sized spp. Identification Young fish are hard to tell apart from Scleromystax kronei. Adults are easier to tell apart. Adult male S. barbatus have a gold nose stripe (shown) above and females remain peppered gray. In S. kronei both sexes develop higher contrast patterning with maturity, lack the nose stripe and have pale gold / silver saddle shaped patches across the top of their lower back. Sexing See images above - males are slimmer, posses a gold nose stripe set against velvet black and cheek bristles. Females are marginally larger than males but not any where near the degree shown in Corydoras species. Females remain peppered grey throughout their life. Distribution Brazil: Rio de Janeiro state in rivers emptying into Guanabara bay; Rio Guapi, Rio Capivari and Rio Inbomirim. Other Parameters The water chemistry isn't too critical for this species except if you intend to attempt breeding them (see below). Despite coming from a tropical zone, this species has a more involved relationship with temperature than one might expect given its origin. Temperature is important in at least how it affects dissolved oxygen levels. This fish will tolerate low temperatures at least for a few months (55°F/13°C) and should not be kept above 77°F/25°C in either well stocked or poorly oxygenated tanks. Ideally, keep the fish in the 68 - 76°F/20-24°C, a range that within which the species will breed. Feeding Sinking tablet and granulated prepared foods with occasional pre-soaked flake will provide a staple diet. Careful feeding of live tubifex, bloodworm or chopped earthworm will promote growth and bring the fish into breeding condition. Furniture For the substrate I would recommend very fine smooth gravel or smooth grained sand, the addition of several large pebbles or pieces of inert rock and maybe one or two clumps of Java fern for a bit of colour. Rooted plants may not get much chance to establish themselves, because these fish do spend a lot of time with their snouts in the substrate rooting around for food morsels. Compatibility Ideally this species should by kept in pairs, the males are territorial. If there are two males in a tank that is not large enough to give each his own space, then squabbles will occur. As the spawning season nears, usually in the early part of the year, squabbles will often turn into real fights where serious damage can be inflicted; death of the weaker individual is not out of the question. A standard 24"x 12" tank would be sufficient for one pair; two pairs would need at least a 36"x 15" if not larger. Suggested Tankmates Generally this is a species that is very easy to find tankmates for as it is more boisterous than many Corydoras. So can be kept with small to medium sized cichlids, larger tetras and even fast glutonous feeders such as barbs. Breeding To attempt breeding, the water should be rather soft and slightly acidic. A pH of 5.5 to 6.5 and the general hardness in the area of 1° to 3°dH. The fish will breed at levels above this but problems arise when it's time for the fry to emerge from the egg. The soft, slightly acid water helps to break down the egg membrane allowing the fry to emerge. Once the fry are free swimming, which is two to three days after hatching, they are able to take newly hatched brineshrimp. This they relish and it does not take them long to fill their bellies - which will appear very pink and distended. A fairly rich and varied diet, along with regular water changes will ensure a good growth rate and in three months they should be well over one inch long. At three months they all resemble their mother in colour pattern. It will be several more weeks before males start to develop their characteristics. By the time the fry have reached their first birthday they should be fully matured adults, although they will still have some way to go before they are full sized specimens. See also the article in Shane's World. Breeding Reports There are 14 breeding reports, read them all here. There are 129 registered keepers, view all "my cats" data.